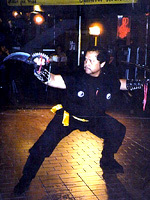 Gaylord Rieta is a singer/entertainer and also a Professor/Grand Master of Chinese Kempo martial arts. He performs Music & Martial Arts from the late 50′s to the present. Gaylord Rieta is a singer/entertainer and also a Professor/Grand Master of Chinese Kempo martial arts. He has performed in the Chinese New Year celebration for the past 14 years. He can do a show of both music and the arts.